It’s the inevitable – a data entry error, a customer gives the incorrect address, or the receiver refuses the shipment, thus sending your perfectly packed order right back to your door. However, if you’re using the United States Postal Service, you’re not only getting the package back but a hefty bill to go with it. Effective June 24, 2011 the USPS significantly raised their rates on undeliverable or return to sender postage. The new rates are being categorized at non-sorted pricing plus an additional $3.00 fee. The effect of these measures not only adds a dent in profit margin but can be quite frustrating as well. For example, based on the previous returns rate, the average two pound USPS package returned to sender for insufficient address or refusal would come back at a rate of $4.90. With the new price increase, that same two pound package is now returned to sender at a rate between $8.17 and $12.32. At a2b Fulfillment, we qualify for special programs with major freight carriers that offer deep discounts on packages that ship to residences. Best of all, 75-80% of these packages are not shipped through the USPS system, meaning that the majority of undeliverable packages are returned at the same economical outbound rate. 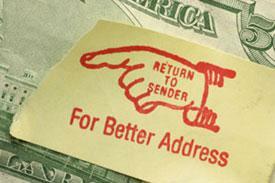 Don’t let a data entry error send your package right back to you with a hefty fee! Take advantage of our discounted shipping and save equally on the outbound and on inbound Return to Sender packages. At a2b, we have all of the components in place for a successful outsourced solution, including modern warehousing and storage facilities, advanced technology, skilled labor, strategic location and discounted shipping. Contact a2b Fulfillment today to see how we can help you and your business by calling 1.866.843.3827 to learn more or email sales@a2bf.com .